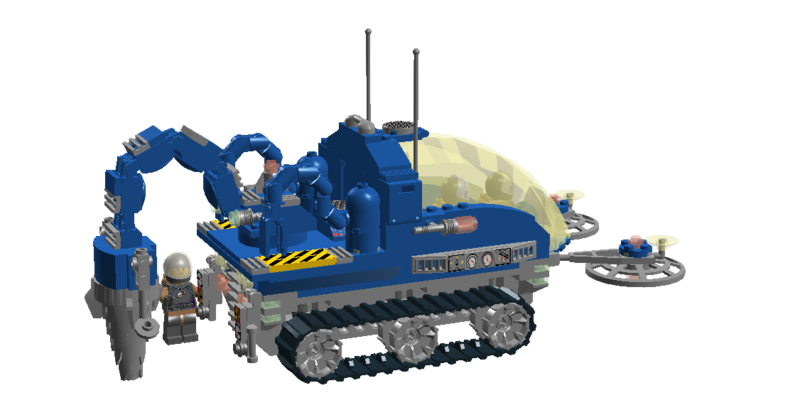 The Wombat (officially the “Type 7 Miner-Explorer”, though it is rarely called that) is a mobile mining and exploration vehicle used in the Neoclassic Space Federation for mineralogical and planetological survey work, including the drilling of preliminary bores prior to actual extraction and exploitation of the ores in question. It features a pair of below-ground scanning devices utilising seismographic equipment, subsurface radar and more penetrative forms of radiation to build up a 3D tectonic and geological map of its immediate area. At the rear is the main drilling rig, on which a pair of hand-held geo-scanners are mounted for transport. The drill itself is mounted on a turntable and multi-jointed arm for ease of transition between drilling and travel modes. Also mounted at the rear are a pair of articulated grabber arms for handling of more volatile samples; these are conveniently located next to the sample boxes amidships. Space miners Hal Burgess and Cutter Vance in the cockpit area. Dale Brickholm is at the back. The Wombat carries a crew of three in a single forward cockpit. There is a hatch leading from the cockpit to the drill arm area, and the entire front of the cockpit (including the steering console column) swings up for easy access, revealing a ladder mounted on the lower hull. 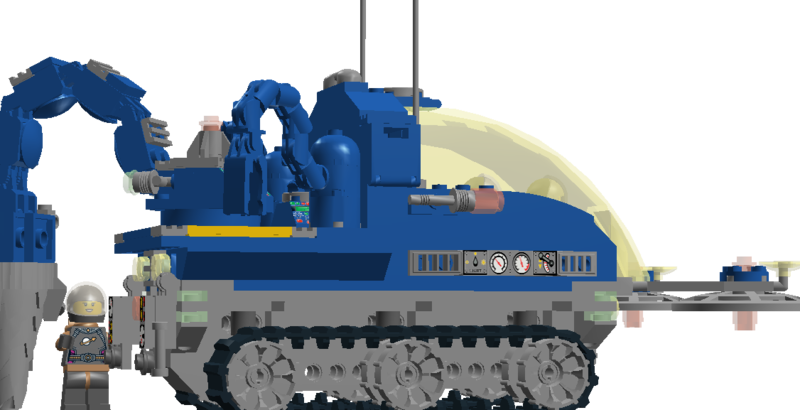 This was a fun model to make. I’ve been wanting an excuse to use the big curved cockpit shield for ages. 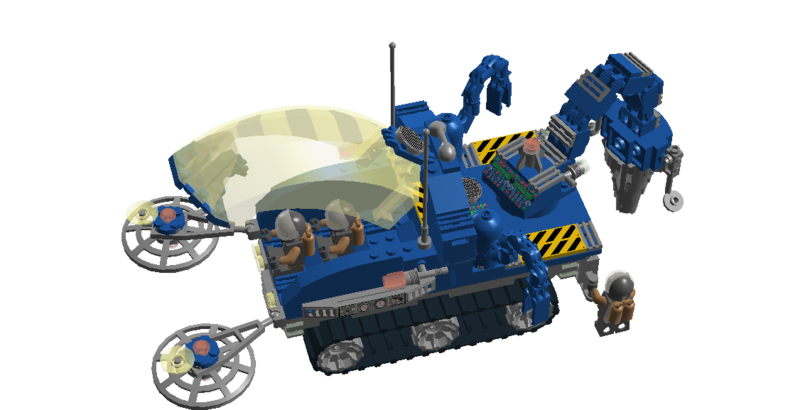 This is still definitely a Neoclassic Space vehicle, and is certainly used in the Saurian Sector where all my dino-themed Neoclassic creations are set, but it doesn’t have a dino name. 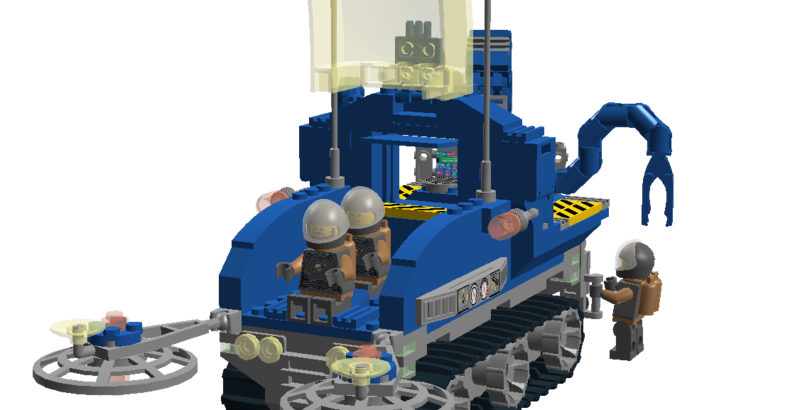 It’s more of a semi-civilian vehicle, and the miners themselves are civilians. I imagine a lot of this sort of specialised work happens under the aegis of Space Fleet Command but not actually performed by Fleet personnel, and I’ve used this excuse to mess around with established Classic Space suit colours to create a new combination. The Dark Stone Grey/Medium Nougat combination is going to represent space miners, at least in my corner of the Classic Space universe. And I used the half-hemisphere visor in transparent brown to further distinguish them from proper Fleet personnel. 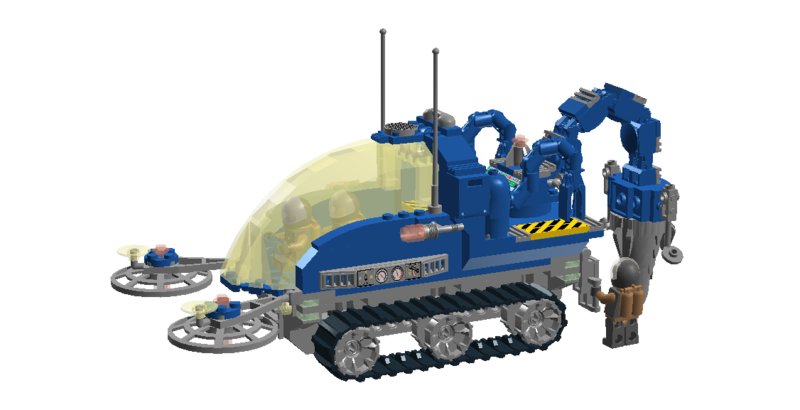 This entry was posted in Lego Classic Space, Saurian Sector and tagged Classic Space Lego, digital Lego, LDD, Lego, Miner, Neoclassic Space, Neoclassic Space Federation, Saurian Sector, Space Miner on March 16, 2015 by geoffhorswood.